The German jewelry house celebrated at the Met. 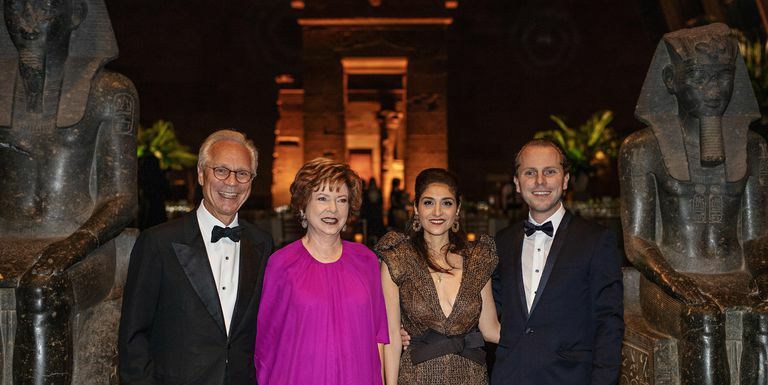 On October 24, Hemmerle celebrated its 125th anniversary with a black-tie soiree in the Temple of Dendur in the Sackler Wing of the Metropolitan Museum of Art. Hosted by Christian Hemmerle, his wife Yasmin, and parents Stefan and Sylveli Hemmerle, guests included art collectors and jewelry connoisseurs Fiona Druckenmiller, Mahnaz Ispahani Bartos, Robin Katz, Alyson Cafiero and Catherine Walsh alongside designer Narciso Rodriguez, Princess Alia Al Senussi and Princess Firyal of Jordan. Hemmerle has been celebrating its 125th anniversary throughout the year with two new bodies of work: Revived Treasures, which paid homage to Egyptian civilization, and Hidden Treasures, which explored Hemmerle’s heritage as medal makers. Established in 1893 in Munich, Hemmerle is a fourth generation, family-run jeweler. If you want to admire the pieces, you’ll have to jet over to Germany—the only Hemmerle boutique in the world is found in Munich—or gain access to their exclusive private showings, held at the Hôtel Plaza Athénée in New York twice a year.